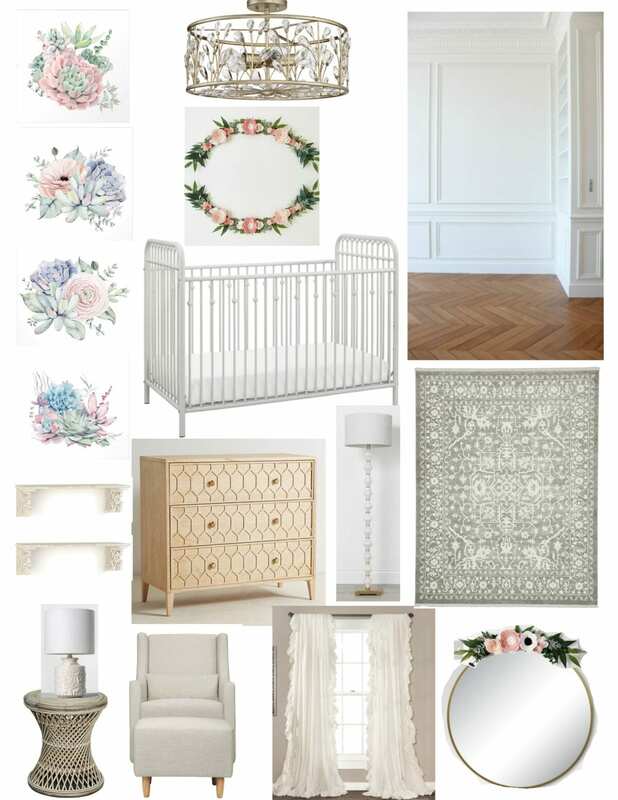 An all white mood board nursery design plan with nature-inspired elements, textures, and floral accents along with a before tour of the space. Maybe since I’m coming into my third trimester next week it’s about time we get started on this nursery makeover gig. Ha! We’ve been a little distracted with the kitchen and back porch and living room refresh and Olivia’s bedroom makeover. 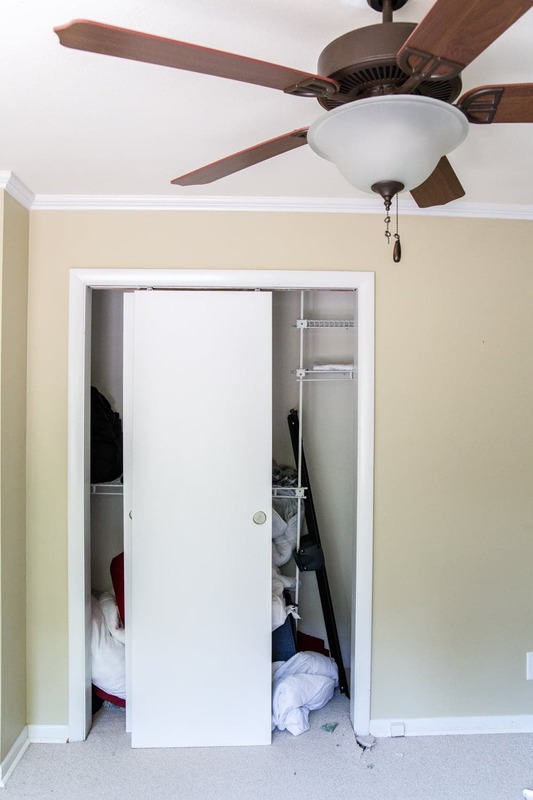 Want to see a room that I haven’t shown on this blog since the day we moved in? Boom. 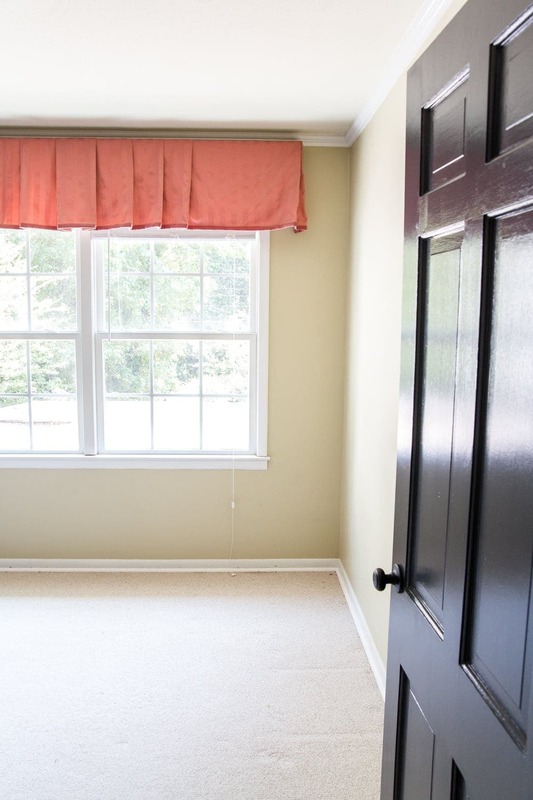 For several months, we used this room as a makeshift guest bedroom without so much as painting walls or even taking down the existing window valance. But we’ve hauled out the mattress and are back to a blank slate to make this space sweet and adorable ASAP. 1. It gets beautiful natural light from that big window. 2. There are original hardwood floors hiding under that old carpet! Yaaaaaay! 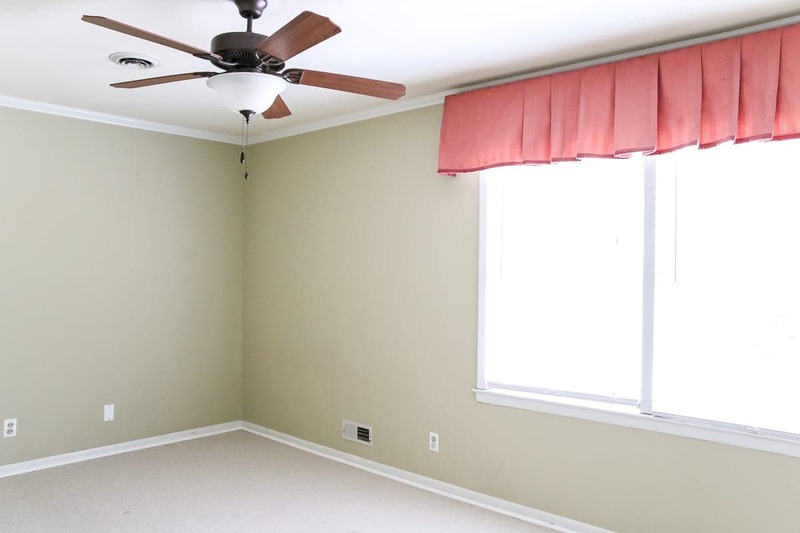 So first thing will definitely be to take down the red gingham window valance, paint the yellowed ceiling a bright white, get rid of the yellowy green-ish color on the walls, and rip up the old carpet to refinish the hardwoods. Once that’s all done, I’m reeeeeaaally hoping the rest falls into place pretty quickly. Because even though I know this kiddo likely won’t sleep much in her room for the first few months, I’ll be so relieved to have it done for a little peaceful escape where our new bundle Regan and I can snuggle and get to know each other this fall. 1. Wall art – (1 | 2 | 3 | 4) I didn’t want to go too theme-y in this space so we could make it easy for Regan to grow into (because we all know the growing happens all too fast). I found these soft pastel succulent prints that will pop beautifully in some simple frames against white walls. 2. Semi-flush mount / pendant light – Since this room has 8 foot ceilings, we’re going with a semi-flush mount light. This one is the perfect vintage-meets-modern-meets-nature-meets-glam to me. 3. White walls with picture frame molding – I’ve been dying to put picture frame molding in a room (and hopefully start adding it to other rooms), so this nursery seems like the perfect space to make it feel classic and simple yet still high-end without too much construction involved. 4. Felt flower swag wall decor – I’m very tempted to try a DIY craft with this, but I might leave this one up to a pro since I’m sometimes craftily-challenged and also… time crunch. It will pop so beautifully against the white above her crib. 5. Vintage style crib – We’re going with this less pricey metal crib versus some of the more high-end versions out there that are convertible to grow with her. We transitioned Olivia directly from a crib at 2 years-old to a “big girl” full-sized bed without much of a problem, so we don’t really feel the need to get a convertible crib that costs double or triple the price this go-round. 6. White carved shelves – We’ll probably put these on the blank wall beside her closet as a little extra space to store keepsakes and small necessities. 7. Applique dresser – I saw this dresser at Anthropologie, but I’m convinced I can put these appliques on a cheaper IKEA (or even thrifted) dresser to create a similar look. 8. Floor lamp – I want to stay away from using the overhead light too often for middle-of-the-night feedings/changings, so I’m sure this floor lamp with a soft white bulb will come in handy. 9. 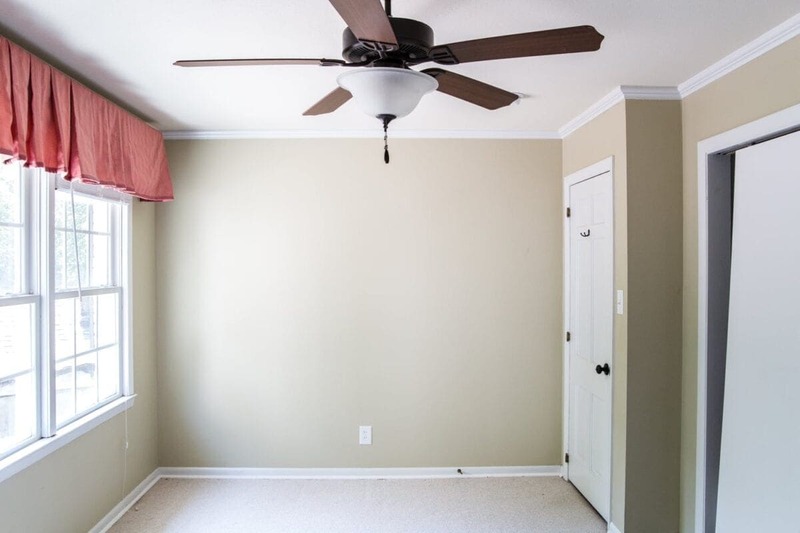 Area rug – I’m sticking with neutral for the rug to keep it versatile in case we change this room up in a couple of years (when this kiddo develops an opinion about it). I love how this one looks slightly traditional yet slightly tribal. 10. Table lamp – I’ll put this small light on the accent table beside the glider so I can have it in easy reach as needed when my hands are full. 11. Accent table garden stool – Must-have beside the glider to keep binkies, sound machine, easy-to-reach baby garb, etc. 12. Glider and ottoman – We’re springing for a nicer quality glider this time than we did with Olivia, and I researched the heck out of this one. We bought a $150 glider when she was born back in the day, but it was so uncomfortable and the mechanisms were jerky and squeaked. Not a good combo when trying to get a baby to sleep. Considering how much time we had to spend in the last one rocking our first born, I’m going for major comfort with one this time. And this glider has a back high enough for us to rest our heads as we’re rocking… must have! Still way cheaper than the designer ones from Pottery Barn and Crate & Kids. 13. White ruffle curtains – The texture of these are so pretty and will make the room feel airy and light. 14. Round mirror with felt flower swag – I’ll probably put this mirror beside the bedroom door to help bounce some light around. The flower swag I’ll attach on top will be a sweet little accent. Are you liking the plan so far? P.S. If you want to know how to create your own design boards for your house, you can see the entire how-to in this post. While we’re on the subject, got any must-have baby item recommendations? I’ll take all the advice I can get. It’s been almost 6 years since I had a baby and everything on the market has TOTALLY changed. I really hope there will be more snuggling than middle-of-the-night freak out sessions. 😉 Hoping the calming feel will help. Whatever works! It might add too much clutter but I would consider a ribbon above the mirror to make it appear as though the ribbon is holding the mirror up. Just a thought. I like everything except the ruffle curtains. To me, they are too fussy and overbearing. I’d go with something feminine, but simpler. IKEA Ritva curtains would be the right color and are a good quality and price and come long. Thanks! Dying see how it all comes together! What a sweet nursery plan Lauren! And congratulations!! ? We are expecting our second, also a girl, in just ONE MONTH and I can hardly believe it. I just shared her nursery on my blog—it is (subtly) Narnia themed! We aren’t quite handy enough to create a beautiful wardrobe like yours, but I’m pleased with how it turned out ? Have fun with your nursery project, it goes so fast! Aw congrats to you too! Off to check out yours! Consider a dimmer switch for the overhead. They can be quite handy. Did you pick a paint color yet? I’m still struggling with the right shade of white and always love your ideas! What a beautiful nursery! It will match your style and look so perfect for your little girl. I like how it is not too baby looking. It can transition well. They aren’t babies for long! Thank you, Julie! I’m excited to see it come together. I know what you mean. We’re big fans of decorating rooms that will “grow up” well. Have been waiting for you to post the design board for your sweet nursery. I knew it would be perfect … beautiful! Can’t wait to see it all come together. I love the rug you chose … what store are you buying it from? Thank you! Oh gosh! I meant to link it! It’s from eSaleRugs. Hi! First of all congratulations. You have planned such a wonderful room for baby Regan. Every detail has been planned and looks beautiful. I noticed the felt swags you’ve chosen. I ordered a set of hoops from her recently and her work is exquisite. There are little details that she does that aren’t noticeable on a website but in person add depth to the design. Her skills are “perfection”. It would not be an easy DIY!! I thought I’d put in my cheering section for her small business just because I was so pleased with her work. I do not know her nor where she lives but the flowers and placement is true art. I just thought. Swifter dusters are great for quick gentle dusting I would think. I think the curtains are fun. I can see your girls playing and giggling together very soon!! That is GREAT to know! I had a feeling I wouldn’t be able to do it anyway. Just looking at them I can tell it is full of MAJOR skill that I do not possess. I’m so giddy to see how these two little ones will interact and become good friends as they grow up. Olivia “talks” to her in my belly every night before bed. It’s the sweetest thing. PS. I just noticed the curtains are $34 something for a pair!! That’s unheard of for 96” curtains let alone a pair. I’d encourage you to purchase them and have them to try out while you look elsewhere because they are sold out in all stores in my area which includes major cities!! They are airy it says so if they look gross? There’s always time to look. Aren’t I in a bossy mood today. Emoji over my face. Haha! I went ahead and ordered them so I’m definitely giving them a whirl! Someone else just told me she used them in her daughter’s room and they look gorgeous in person, so now I’m extra hopeful. 🙂 I just cannot bring myself to spend $200 on curtains. That’s insanity! I love it. It all looks beautiful! Maureen Cracknell (you can google search) does some adorable feltwork for kids. I think she has an etsy store in addition to her blog which is mostly quilting based . She may be interested in doing something custom?! Never hurts to ask. Can’t wait to see updates. Fab choices. Love it all. Just a heads up, none of the art links (succulents) are working for me! What a darling room this is going to be for that precious little baby! Love what you have planned! Will look forward to seeing it once you have everything in place! What a sweet nursery. I am getting a shabby chic furniture and decor vibe, but subtle, not everything in the room. I like it! Not over the top. A white shabby chic armoire might be a good choice too. This is something that can grow with your child as they get older and not always be for clothes storage. Toys, books, games and more!